So the Inconjunction Science Fiction and Fantasy Convention on the east side of Indianapolis (or as I call it, the old hometown) happens Fourth of July weekend, an awesome event celebrating all things speculatively geeky, and it’s always a highlight of my year. This year I’m attending as part of the Speculative Fiction Guild (SFG) and we’re hitting the con in a big way. We’ll have a vendor’s booth with all of our titles, where I’ll have the Seventh Star collection of my paranormal thriller trilogy together in paperback for the first time. 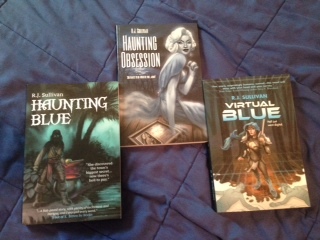 Convention pricing is: Haunting Blue: $15; Haunting Obsession: $12; Virtual Blue: $15. Autographs are free and worth every penny you pay. Also at the SFG booth: John F. Allen, Matthew Barron, and Eric Garrison. Directly next to us is SFG member Crystal Leflar, who’s running her OWN vendor booth as event marketer for Nightscape Press, so check out their array of titles along with her own books. Inconjunction was the first con I ever attended over 20 years ago as Mrs. RJ’s date. The authors were my heroes and I always wanted to be where they were. Now I’m dpoing just that for my third time. Unreal. So it turns out, the awesome people who throw Inconjunction (the Circle of Janus) moved their monthly meetings to a few miles down the road from where I live. I opened my big mouth and said “sure, the SFG will do as many panels as you want.” So they got us hopping this year! Here’s your Stalker’s Guide to finding me. 4 pm–Main Programming Room: Book Trailers–what are they good for? With: Eric Garrison and Author Co-Guest of Honor Kat Falls. 8 pm–Grand Ballroom 7 and 8: Analyzing the History of the Comic Book Movie With: John F. Allen and Mike Suess. 4 pm–Grand Ballroom 7 & 8: Making the Jump to a Series With: John F. Allen and Mike Shepherd. 7 pm–Harrison Room: SFG Writer’s Roundtable: Making the most of local settings in genre fiction With: The SFG: John, Eric, Matt, and Crystal. 10 pm–Grand Ballroom 7-8: Candlelight Horror Reading With: John F. Allen, Crystal Leflar and Jeff Seymour. At this time, I have no plans to return Sunday. While you’re there, say hi to Michael West, James Barnes of Loconeal Books, local filmmaker Kate Chaplin of Karmic Courage Productions, and check out the show by Five Year Mission. WOW! How’s that for a packed weekend! This entry was posted in Uncategorized and tagged authors, Blue Series, Blue Shaefer, Book Promotion, book readings, book signing, book tour, book trailers, circle of janus, comic book movies, convention, crystal leflar, Eric Garrison, Five Year Mission, ghost stories, ghosts, Haunting Blue, Haunting Obsession, Inconjunction, Indiana authors, Indiana filommaking, John F. Allen, Karmic Courage, Kat Falls, Kate Chaplin, loconeal, Matthew Barron, Maxine Marie, Michael West, Mike Shepherd, NIghtscape Press, paranormal thriller, Rosemary Laurey, seventh star press, Speculative Fiction Guid, Virtual Blue, writer workshop. Bookmark the permalink.